Lucky Jackson lives life to its fullest. His days are spent racing cars, gambling, and chasing women. His nights are spent partying, gambling, and chasing women. But when Lucky meets a red-headed bombshell named Rusty Martin, all bets are off. The boy is instantly smitten, but the girl wants nothing to do with a player. To win Rusty’s heart, Lucky must utilize all his charm, good looks and cunning. He’ll also have to sing about seven songs. To make matters even more complicated, the suave Elmo Mancini also has his eye on the lovely lady. Worse yet, Mancini is also a favorite in the upcoming Vegas Grand Prix. Lucky would like nothing better than to win both the race and the girl; and after a triumphant first date, love seems to be coming Lucky’s way. But all hell breaks loose when Rusty hears about a fatal mishap where one of Lucky’s racing buddies was killed in a ball of smoldering, twisted metal. Terrified, she forces Lucky to choose between a life of love and security, or the perilous life of a race car driver. Despite his strong feelings for Rusty, Lucky isn’t necessarily torn between the girl and his passion for racing. It takes approximately five minutes for Our Hero to decide that he will participate in the Vegas Grand Prix, with or without Rusty’s approval. But if all goes according to plan, Lucky will drive away with the prize money and the girl; it’ll take just a little more of his charm, good looks, and approximately three more songs. 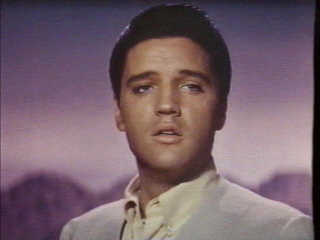 My second foray into the films of Elvis and all is well. Clambake was only slightly tedious, and Viva Las Vegas, much to my surprise, was thoroughly enjoyable. I don’t expect high art when it comes to Elvis’ films. I expect entertainment; and Viva Las Vegas is, at the very least, entertaining. The story is pretty thin, but moves along at a good pace. I credit most of the film’s energy to the chemistry between Elv is and Ann-Margret. It doesn’t take rocket science to notice that these two really dig each other. And what’s not to dig? Ann is quite a sight with her tight dancin’ britches and flaming red hair; and Elvis, well, is Elvis. Viva Las Vegas is fun, and it looks like the two leads are having fun making it. The only thing that bothered me was the big race at the end. I loathe racing movies. Fortunately, the Grand Prix itself only lasted about ten minutes; and you really can’t go wrong with a foolproof formula involving rapid acceleration, hairpin turns, fiery wrecks and Elvis’ face in front of an obvious blue-screen. The highlight of the epic finale had Elvis watching the obliteration of one of his buddies in a particularly nasty crash, then turning apathetically back to the task at hand. You can’t blame him. Can’t affor d to lose the big race, right? 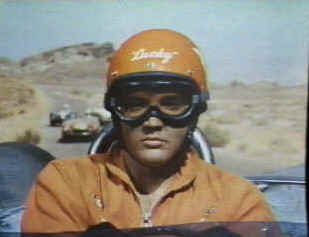 The scary thing is: I’ve only watched two of Presley’s movies, and so far, both have prominently featured auto racing. I mean, what are the odds? The man has made over 30 films, yet I randomly pick two and they both focus on life behind the wheel. Perhaps Elvis’ racing movies are a genre in and of themselves. But let’s focus on the positive (for once). 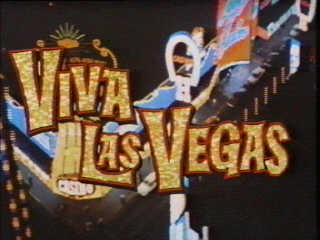 Viva Las Vegas is a fun movie. The acting is good, the story serves its purpose, and the songs, for the most part, are inspired. Highlights of the musical numbers include a verbal duel between Elvis and Ann-Margret entitled “The Lady Loves Me”, the rockin’ “C’mon, Everybody” and the requisite ballad “If You Don’t Think I Need You”. 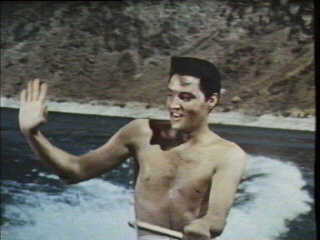 (It just wouldn’t be an Elvis movie if he didn’t ask some girl to love him tender.) Of course, you can’t forget the title song, which even the most casual fans are familiar with. The most surprising track on the film was the Forte Four’s “The Climb”, a bluesy r & b number that I wouldn’t have expected from an Elvis film. There’s also Ray Charles’ “What’d I Say” (covered by Elvis and Brian Dennehy!). Musical lowlights are few and far between, but Ann-Marget’s “Appreciation” is pretty bad. But what do I know? The piece was obviously an influence to Madonna’s “Material Girl” video. So it must’ve struck a chord with someone. And for the record (no pun intended), I don’t like that song, either. Fast-paced and fun, Viva Las Vegas is Elvis at the top of his game.